May 16, 2018, EAST PROVIDENCE – Marine archaeologist and third-generation Rhode Island diver David Robinson is very excited about a collection of old timbers exposed along the East Providence shoreline. He recently discovered that these are the remains of 29 abandoned vessels that make up the largest ship graveyard in Rhode Island – and that’s an amazing feat in a state with a rich shipping and sailing history. “This site captures the maritime focus that Providence had during its ‘Golden Era,’ at the peak of its history as an industrial port city,” he said one recent morning, the excitement clear in his voice. “The Bay has been a highway forever” and it only made sense that with the birth of America’s Industrial Revolution in Pawtucket, there would be some visible remnants of that time. Among the remains, according to Robinson, are six sailing vessels, a schooner barge, the Bay Queen and Mount Hope sidewheel steamers, and a collection of various types and sizes of scow-barges. 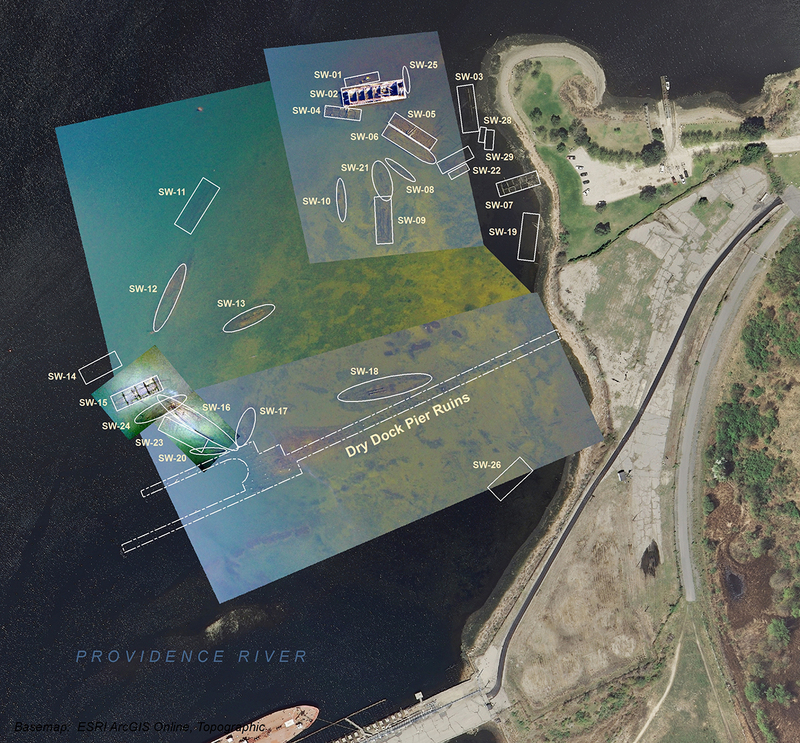 Now, the Rhode Island Coastal Resources Management Council (CRMC) is working with the City of East Providence, the East Providence Historical Society, and East Providence Historic District Commission and others to preserve and bring awareness to the site off Bold Point, called Green Jacket Shoal, and one of the most unique ship graveyards in the country, with Robinson’s help. Through the creation of a Marine Protected Area (MPA) around the submerged vessel and dry dock remains, East Providence’s goal of preserving and increasing awareness of the site will be advanced, and archaeologists like Robinson will be able to continue to study the site’s cultural resources in detail, documenting and preserving the unique information they contain for future generations of Rhode Islanders. The MPA will fall under the auspices of the CRMC’s newest Special Area Management Plan, called the Bay SAMP, which will focus the most up-to-date science on the activities and uses of Narraganset Bay, as well as its natural resources. The city’s historic groups would also like to designate the area as a National Register Historic District for an added layer of consideration and protection. And this site is unlike others in Rhode Island and the rest of the country, Robinson said. Nowhere else can one find the remains of this many vessels in such a small area – approximately 30 acres, of this age – some dating back to the mid-19th century, of this diversity of type – representing six different vessel classes, and this type of construction – all made of wood. And they don’t appear to have been just discarded randomly at Bold Point, which adds to their value, he said. Bold Point, or Burges Point as it was formerly known, was one of the first areas of East Providence’s waterfront to be developed and was located in an area called Watchemoket. A number of the people who lived there worked at the shipyard on the Point, and at the coal pier nearby that was built and owned initially by Lehigh & Wilkes-Barre Coal Company. A U.S. Office of Coast Survey 1865 chart of Providence Harbor – the earliest detailed depiction of that waterway Robinson’s research found – refers to the existence of eelgrass on the shoal, the color of which is how the location got its “Green Jacket” name. Robinson cited a printing of “The King’s Pocket-Book of Providence, R.I.” a handy guide to the city, for this bit of history. The Providence Marine Railway & Drydock Co. at Bold Point was the last Providence shipyard to build wooden merchant sailing vessels, according to Robinson, and it also boasted Rhode Island’s first floating dry dock. 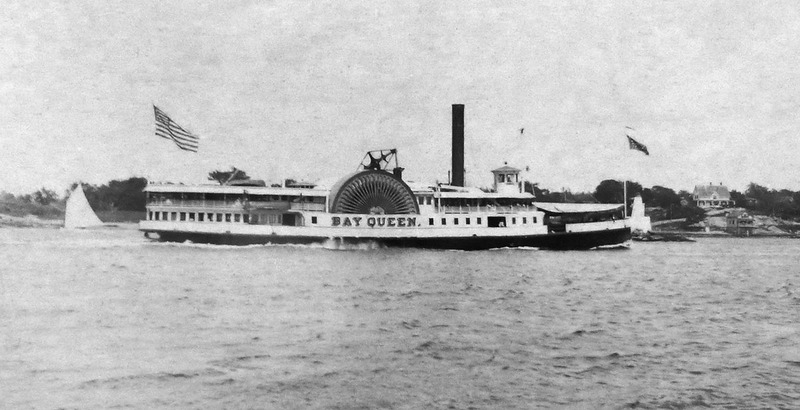 It was a shipyard that produced not only three-masted schooners for international trade, but also serviced local vessels, including the Bay Queen and Mount Hope, Robinson said. When Robinson set out to identify the vessels on the shoal, he found the first reference to the graveyard in a Providence Journal article from 1915, lamenting plans to change the course of the Seekonk River (though that never happened because its chief proponent, Charles M. Hays, president of the Grand Trunk Railway, died on the Titanic). An Army Corps of Engineers map from 1931 shows 24 derelict vessels at the site, 17 of which Robinson has determined are still present on the shoal. Greenleaf said the HDC realizes that while the graveyard is not full of renowned ships (with the exception of the two steamers) and that there are few remaining architectural details (preserved above their former water-lines), the protection and documentation of the vessels, along with interpretive signage, online virtual tours, boat and kayak tours and continued educational outreach has enormous potential to bring awareness of everyday maritime activity of the upper Bay in the late 19th century to the public. According to the commission, it is seeking funding for the signage and has been in contact with the R.I. Historic Preservation and Heritage Commission to determine if the site could be eligible for listing in the National Register of Historic Places. Under the CRMC MPA, law enforcement authorities like the R.I. Department of Environmental Management (DEM), the State Police, and the East Providence harbormaster will be authorized by the CRMC to protect the graveyard and the integrity of the remains. It will also establish a restricted perimeter around the entire area.